For the color challenge at Splitcoast today – Melon Mambo, Regal Rose and Pink Pirouette. 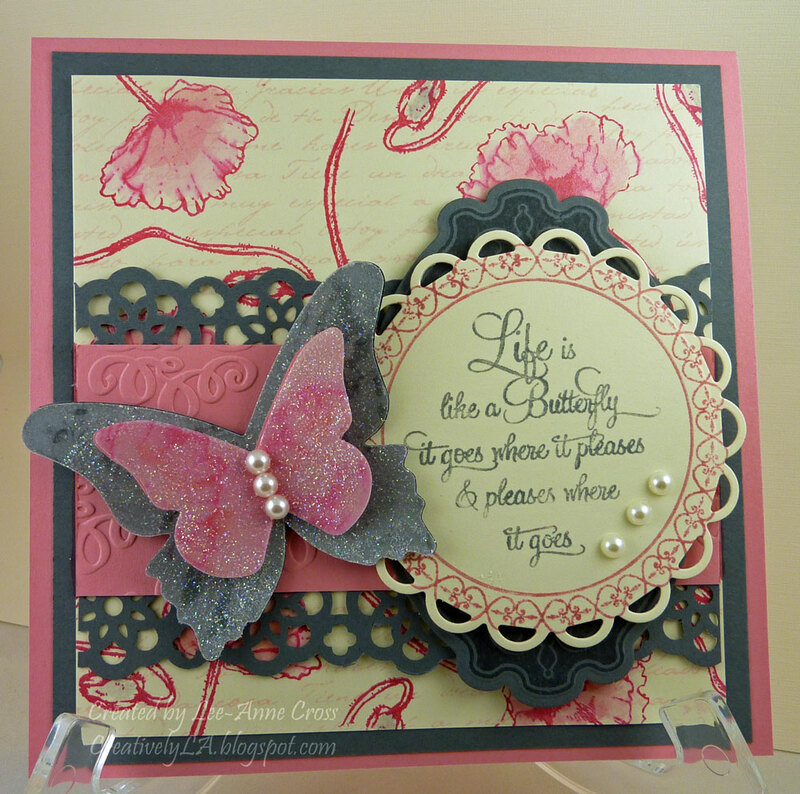 The cardbase is a 6″ square in Regal Rose. Next comes a layer of Basic Gray, followed by a layer of ivory. The layer of ivory is home made designer paper. The poppies and buds have been stamped in Melon Mambo. Then it was overstamped in Pink Pirouette with a background stamp and the flowers and buds were watercolored. The next layer is a two separate strips of Basic Gray that have been punched, followed by a layer of Regal Rose that been dry embossed. For the sentiment, I stamped the Waltzingmouse label on a Label 10 nestabilities die cut. Then, the Justrite Stamp was stamped in Regal Rose and Basic Gray. It’s been cut out with a Lacy Circles nestability die. The butterfly actually has four layers. I cut out the bottom layer in both vellum cardstock and Basic Gray. The Basic Gray layer has been stamped with one of the same floral images, also in Basic Gray and then the vellum piece has been embossed with Irridescent Ice from Stampin’ Up. I repeated the same procedure for the top part of the butterfly, but in Regal Rose. Three pearls on the butterfly and three more on the sentiment are the only embellishments. Accessories: Stampin’ Up! Lace Ribbon Border punch, Big Shot, Wizard, Nestabilities Labels 10 and Lacy Circles, Couture Creations Satine embossing folder, Versamark, Stampin’ Up! Irridescent Ice and Basis Pearls. I hope you enjoyed this creation today and I hope you have a wonderful Tuesday!